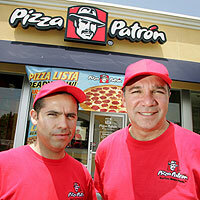 Pizza Patron franchise business opportunity. Free Pizza Patron business franchise information. Pizza Patrón is leading the industry by developing our brand exclusively in Hispano/Latino communities. This singular brand focus sets us apart from our competitors and allows us to develop unwavering loyalty from our customers. For more than 20 years, we have created a unique Latin experience in our stores. “Service to Community, Commitment to Value” has been Pizza Patrón’s mission statement since the first store opened in 1986. From the beginning, we have been passionate about becoming the pizza of choice among Hispanic consumers. Our unit economics are designed to weather a constantly changing business climate. Also, the value positioning of our menu makes our products accessible to a very broad base of consumers and makes our concept virtually economy-proof. What makes owning a Pizza Patrón restaurant a great business opportunity? Over 20 years of experience with proven success. Highly customizable product with universal appeal. Corporate support from industry-tested professionals offering assistance in all facets of the business. Professional assistance in site selection; fully developed designs for a wide variety of spaces. Strong unit economics; relative low cost to open and operate create optimal position for solid returns. Operational support with hands-on professionals to assist in training, store openings and ongoing operational needs. Focused brand development including extensive marketing, advertising and public relations support. The ability to reproduce our excellent product consistently every time, in every market, is key to the long-term development of enthusiastic and brand-loyal customers. Our main focus is making hot, quality pizza quickly and offering it at an unparalleled low cost to our guests. Having a simplified menu empowers us to meet this goal with proficient regularity. We occupy a position in the marketplace that has been overlooked and virtually ignored until recently. While most companies merely market to Hispanics, our entire concept is modeled to make a powerful personal and cultural connection with the Hispanic consumer. High visibility and dedicated participation at strategic events, along with TV, radio, outdoor and print advertising, continually enhances and solidifies Pizza Patrón’s intrinsic connection to the Hispanic community. Support systems are in place to help you during each phase of the franchise process. From initial training to store opening assistance and ongoing support, the Pizza Patrón team is with you every step of the way. To learn more about the Pizza Patron franchise opportunity, simply complete the form below.